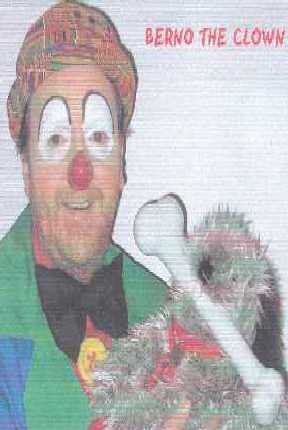 Berno the Clown; professional, realiable service, clowning, comedy magic, ventriloquism, story telling, balloon modelling, juggling. Berno is available for birthdays, christenings, weddings, walkabout and all corporate events. Berno has over 25 years experience working with children, and has alot of skills with children and adults with special needs.